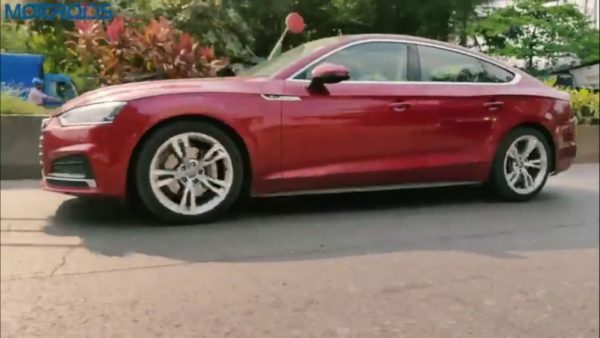 The Audi A5 is a fun looking take of the Audi A4 sedan. 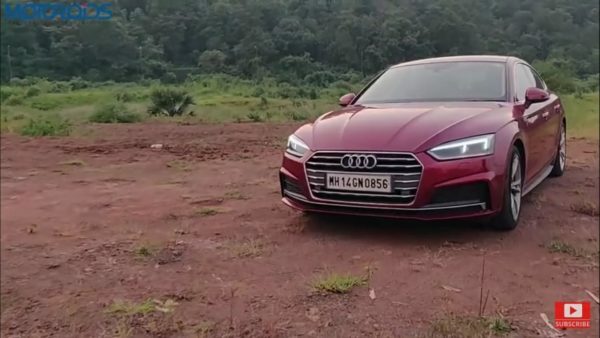 This Sportback with its sloping roofline and subtle highlights looks much more charming and striking than the Audi A4 sedan while offering the familiar A4 like feel. 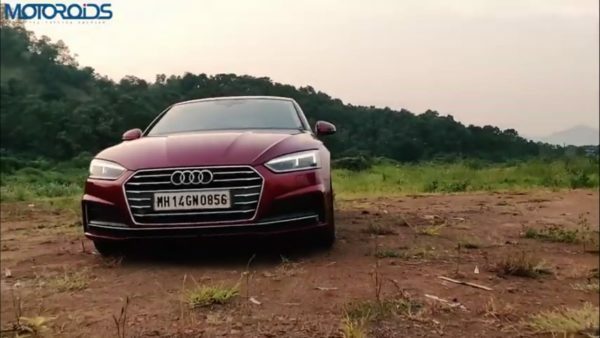 Audi sent this car to the Motoroids garage some time back and here is what we have to say about the car in our detailed review. The front end of the A5 looks very charming and draws a lot of attention. Audi has managed to hide the bonnet line in a very beautiful manner keeping the front end of the car very clean. The one-piece front grille with its matte aluminium treatment looks rather striking and the LED headlight not only look great but do a good job of illuminating the road. A look at the side of the vehicle will assure you the added length this car has received in the second generation of production. The roofline slopes directly in the bonnet which looks very sporty. The wheels measure 18-inches and get 245 section tyres. Things at the rear are very neat, the rear LED lights are angles to replicate the ones up front. The twin tailpipes add an essence of sportiness to the rear side. Things on the inside of the Audi A5 are sporty yet sophisticated. You enter the cabin by opening the beautiful frameless doors. The interior of the car is very well appointed and feels similar to the top of the A4. The wood inserts have a nice matte treatment and feel very nice to look at it. The interiors are very minimalistic and there are not a lot of buttons present. You get a sporty flat bottom steering wheel as well. Despite the sloping roofline, the rear headroom seems sufficient although 6-footers may hit their head on a bump. The knee room and legroom are quite sufficient and the car can accommodate 4 people in comfort. The middle passenger would face some trouble due to the transmission bump in the middle of the car and long journies with three people at the rear cannot be recommended. 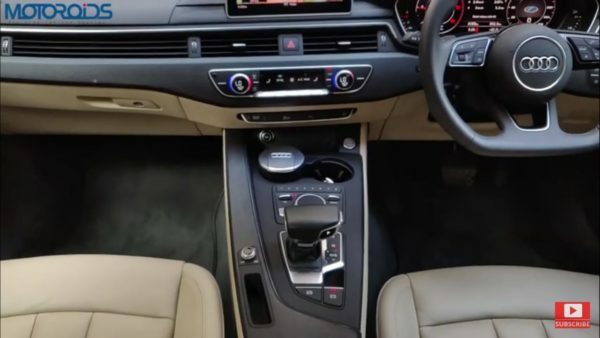 The A5 is packed in terms of technology, you get features like electric seats with lumbar support for the front row, a three-zone climate control and much more. 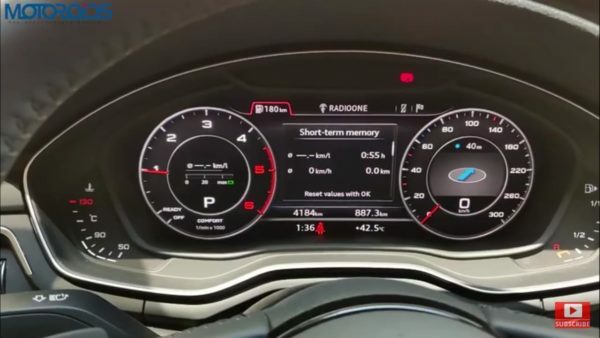 The instrument console comes in the form of Audi’s virtual cockpit which essentially is a large screen which can be customised to suit the needs of the driver. The central screen may not be a touch sensitive unit but you get a trackpad which can be used to control the screen. Moreover, the buttons on the steering wheel can be used to control the virtual cockpit screen in the instrument console. You also get an electric boot which can be opened and closed with the press of a button. Coming to the main highlight of this sporty sedan. The A5 uses a 2-litre diesel motor which has 190 horses and a twist of 400 Nm. Power is sent to the front wheels via a 7-speed S-Tronic gearbox which propels the car to a ton within 8 seconds. Audi claims it to be a sportier version of the A4 and it sure is. The lowered ride height and conventional steering make it a delight to drive. The A5 is much more than a sporty-looking version of the A4 when you are sat behind the wheel, more on this aspect in the review of the car. To sum things up, the Audi A5 is a fresh and sporty take on the A4 sedan and is a car that you want to drive instead of being driven around. At a price point of INR 56 Lakh, this is a car that has no competition and if it suits your needs, we definitely would recommend it. Do watch our in-depth review of the car linked below and leave your questions in the comment section.